Among the more ambitious policies that have been proposed to address the problem of escalating student loan debt are various forms of debt cancellation. 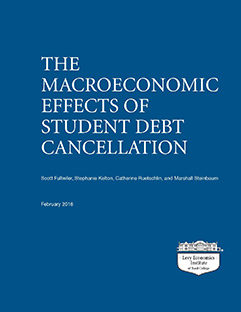 In this report, Scott Fullwiler, Research Associate Stephanie Kelton, Catherine Ruetschlin, and Marshall Steinbaum examine the likely macroeconomic impacts of a one-time, federally funded cancellation of all outstanding student debt. The report analyzes households’ mounting reliance on debt to finance higher education, including the distributive implications of student debt and debt cancellation; describes the financial mechanics required to carry out the cancellation of debt held by the Department of Education (which makes up the vast majority of student loans outstanding) as well as privately owned student debt; and uses two macroeconometric models to provide a plausible range for the likely impacts of student debt cancellation on key economic variables over a 10-year horizon.